Just returned from the rally against racism and violence in Jerusalem. It was wonderful to be there. With so many people who in less than 24 hours after the news regarding a suspected racist attack against a young Palestinian broke out got together to say no to racism. We are not even sure yet that this was a racist attack. Never mind, our message had to be heard. This is our country and we won’t let the racists win. I was especially pleased to see the crowd at the anti racism rally after having passed a small gathering by racists chanting “Death to Arabs”. 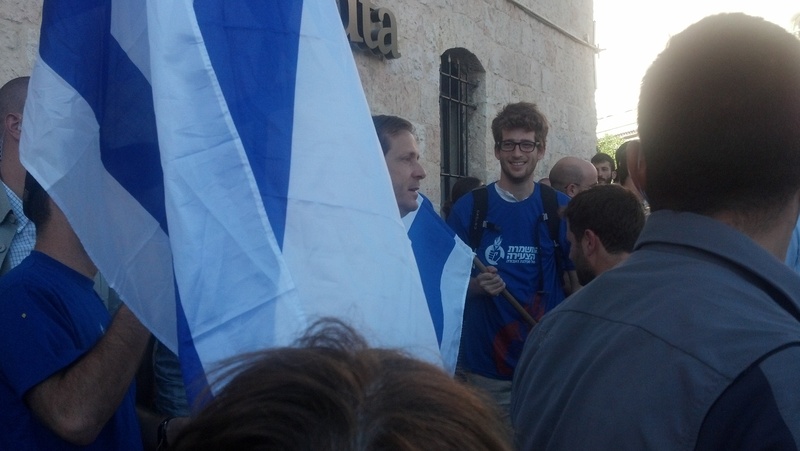 The most moving moment at the rally for me was when the head of the Israeli opposition Isaac Herzog came and took pictures among the crowd. He also spoke. Don’t ask me exactly what he said. By that time I was in a deep conversation in Persian with my Iranian friend Ashkan Safaei who had also attended the rally. He lives in Jerusalem. The conversation lasted 1.5 hours and extended over coffee. Then I got on the Jerusalem light rail to go to the Central Bus station, and before the doors closed, in walked an elderly gentleman with his daughter. He started speaking to her in a loud voice, not only in Persian, but in a thick Esfahani accent. He had left Iran only a couple of years ago. Suddenly I found myself listening to him talking about the beauties of Esfahan, and of course, how he knows my entire family, right up to my late grandfather Meir, and my relatives in Israel. My past and present, in full circle, completed over a single trip to Jerusalem.